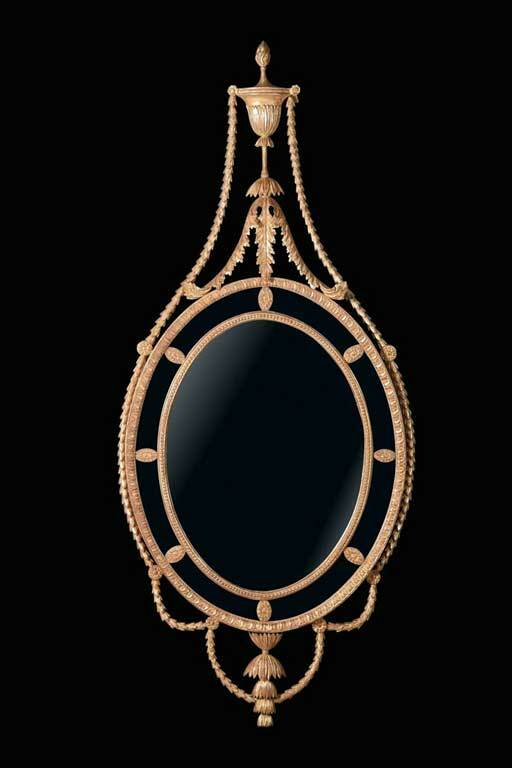 A carved oval mirror of Adam design with leaf carved outer frame and bead carved inner frame, the surrounding border glasses are punctuated by oval flower-head paterae. The cresting formed of a classical urn. The flame finial is raised upon a gathered acanthus leaf spray and with trailing garlands of husks cascading to the apron and gathered to the frame by carved paterae. Robert Adam, (1728-1792), is perhaps the best known British Neo-Classical architect, designer and interior decorator; his name is a household word today. Adam, the son of a Scottish architect, studied in Rome between 1754-8 where he knew Piranesi, Clerisseau as well as other influential Neo Classical artists. While he was in Rome he cultivated the rich and noble English tourists, many of whom were to become his patrons. Height 1600mm/63" - Width 710mm/28"